$5.99 build your own premium bled angus burger mondays - plus fries. $5.99 tacos on Tuesdays. Two tacos plus chips and salsa. Wing Wednesdays. See store for details. 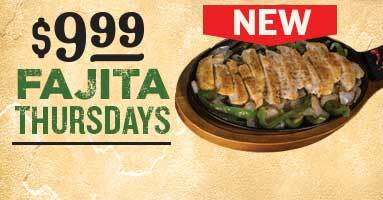 $9.99 eat-a-fajita-thursday. Try Angus skirt steak, grilled shrimp or seasoned chicken. At participating locations. Pricing may vary. See stores for details. Surf and Turf or Turf and Surf? You decide! NEW Surf and Turf Fridays. 6 oz. USDA choice cut sirloin and eight grilled or five fried shrimp plus fries and salad for $12.99. Available at participating locations. See store for details. Premium blend angus burgers. 3X Premium. Chuck | Brisket | Short Rib. Give them a big, beefy gift. 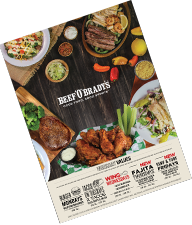 When you give the gift of Beef 'O' Brady's, your special someone can make any pla they want to. Our cards are good at any Beef's, for any amount you'd like. See you at Beef's! Go to the Gift Cards page. Sign up for rewards. Live it up all year. 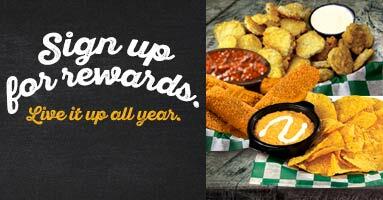 Score a FREE shareable Starter on your next visit when you sign up for Team 'O' Brady's. Sign up now.